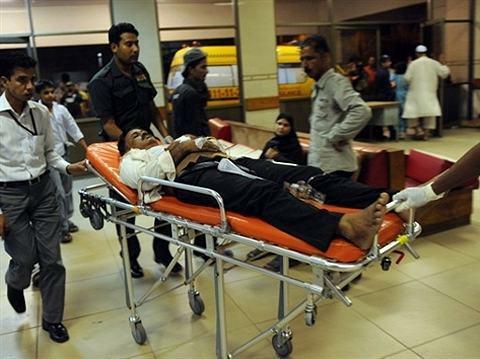 A principal was killed and eight other people were injured in a grenade and gun attack on a school in the Pakistani city of Karachi, a police spokesman said Saturday. An unidentified motorcyclist hurled the hand grenade at the private middle school in the Baldia Town area of Karachi before letting off a volley of shots, police spokesman Asif Nawaz Sheikh told CNN. The school principal, named as Abdul Rasheed, was badly hurt and later died of his injuries in the hospital, the spokesman said. The eight others injured included a teacher and students at the school, he said. They were transferred to the Jinnah Post Graduate Medical Center and the Civil Hospital. Caretaker Prime Minister Mir Hazar Khan Khoso condemned what he called a cowardly attack on innocent children, the official Associated Press of Pakistan (APP) news agency reported. The targeting of school children, including girls, reflected the brutality of the terrorists, he said, according to APP. Khoso, the former chief justice who was sworn in as interim prime minister less than a week ago, directed the local administration to give all the help needed to the families affected. The attack is only the latest to target educators in Pakistan. In January, five teachers were killed near the town of Swabi in the volatile northern Khyber Pakhtunkhwa province, the United Nations says. In the wake of Nazli’s death, an online petition has been set up calling for Pakistan’s government to take a greater role in protecting girls and teachers to safely attend school. First to sign it was Pakistani schoolgirl Malala Yousafzai, who was herself the subject of a vicious attack last October. The 14-year-old was riding home in a school van in the Swat Valley, a Taliban stronghold, when masked men stopped the vehicle and shot her in the head and neck. Malala, whose campaigning for girls’ education in Pakistan gained international attention in 2009, has made a good recovery since but is still receiving treatment for her injuries in Britain. U.N. Secretary General Ban Ki-moon issued a statement Thursday through his spokesman condemning the recent attacks on teachers in Pakistan. “In addition to the tragic loss of life, violence against teachers undermines confidence in education systems, traumatizes students, and discourages parents from sending children to school,” the statement said. Former UK Prime Minister Gordon Brown, who serves as the United Nations Special Envoy for Global Education, has championed education issues in Pakistan, especially after the shooting of Malala. Pakistanis for Peace Editor’s Note– Girls and women are under attack in Pakistan where they can not get an education for fear of their lives in large parts of the country. When educators and teachers have to fear for their lives for teaching the next generation of young girls and those very same girls also have to fear for their lives for simply going to school, then what does that say about the present and future of this country? We think that one thing is certain and that is for many Pakistanis, their nation has become a real life hell hole that is easily the most disturbing and dangerous country in the world, no offense to both North Korea and Iran but neither of you are even in Pakistan’s class. Not with its mixture of being a fractious and populous nation that is behest with religious and ethnic animosity while being embroiled in poverty and extremism which is topped off by militancy and nuclear weaponry. Add to this chaotic mix numerous attacks on women and girls for pursuing education, then you simply must conclude that what you have is a nation with a horrendous present and a dreadful future. 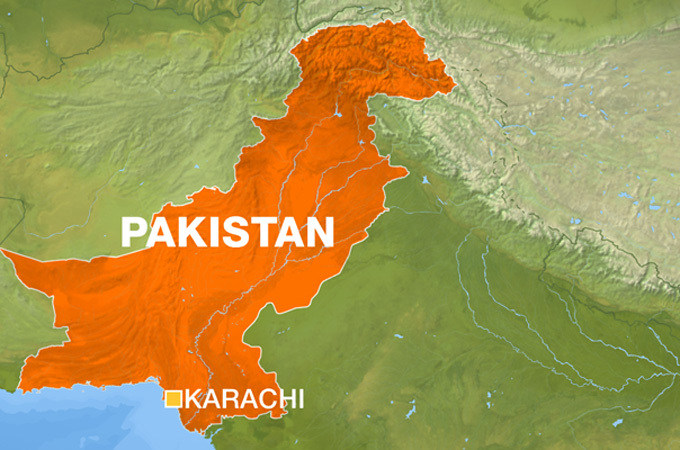 KARACHI, Pakistan – Gunmen have killed at least 25 people in Karachi in the past 24 hours, raising tensions in Pakistan’s largest city as voters cast ballots Sunday to replace a provincial lawmaker murdered in August. Police said they were still investigating the motives behind the shootings, but many so-called “target killings” in Karachi have been linked to gangs controlled by the city’s main political parties, which have been feuding for much of the last 20 years. “We cannot say whether all the killings were politically motivated or some gangs were involved because the killings took place in different parts of the city and were not confined to the area where the elections were being held,” Karachi police Chief Fayyza Leghari said. The two parties most linked to violence in Karachi — the Muttahida Quami Movement and the Awami National Party_ have their electoral bases in different ethnic groups that make up a large chunk of the city’s population. The MQM claims to represent the Urdu-speaking descendants of those people who came to Karachi from India soon after the birth of Pakistan in 1947. It is secular and likes to speak out against the so-called Talibanization of the city, a jab at the Awami National Party, which represents the ethnic Pashtuns from the Taliban heartland in the northwest. Raza Haider, the member of the provincial assembly who was gunned down in August, was a senior member of the MQM. In the wake of the shooting, the MQM accused the ANP of supporting Islamist militants suspected of being behind the murder — an allegation denied by the ANP. Both parties were competing for Haider’s vacant seat, but the ANP announced Saturday evening that it would boycott the election, saying the MQM would rig the vote. The shootings began around the time the ANP made its announcement. The dead include members of a broad range of ethnic groups in the city, he said. The killings were reminiscent of the violence that followed Haider’s murder. At least 45 people died in the days following his killing. Police have arrested at least 60 people in connection with the most recent shootings, Mirza said. But few killers in such cases have ever been brought to justice, and motives for the attacks have not been revealed. The rising tension between the MQM and the ANP represents a serious danger to stability in Karachi, a city of some 16 million people and Pakistan’s commercial hub. Pashtuns have been arriving in the city in greater numbers in recent years, fleeing Pakistan army offensives against the Taliban. An estimated 4 million Pashtuns are now in Karachi and many live in sprawling slums on the outskirts that are “no-go” areas for authorities. Violence has surged in Karachi this year with hundreds of people slain in target killings. This increase has echoes of the city’s bloody past. In the 1980s and 1990s, Karachi was regularly convulsed by violence in which hundreds were killed. MQM leader Altaf Hussain fled to London in 1992 as a result of that bloodshed and was granted asylum. He regularly addresses large gatherings of supporters by telephone link.